... to get to the Pacific Science Center. We've been members, on and off, for several years, and the boys have loved the time we've spent there. It's a wonderful kid-friendly place, with lots of hands-on exhibits, that have enriched our homeschooling... and it's FUN. He was much more interested in an entomologist, who piled (dead) monarch butterflies in his hands. Apparently (they're poisonous, but you knew that, right?) that's how many you'd have to eat for them to kill you. Just in case you wanted to know. He also showed us how to tell males from females, by a pheromone packet on the males' wings. We visited the touch tank, saw a lot of very creepy animals (giant hissing cockroaches, pythons, naked mole rats. black widow spiders), and some not-so-creepy ones, like these diving beetles. We are intrigued at the way they pull a bubble of air down with them, like a little scuba tank. Cool, yah? Wyatt played a guitar... from inside. And all three boys tried several of the physical challenges, like this endurance challenge. How long could you hold the chin-up position? I think Wyatt went 37 seconds. That was all fun and good, but the real reason we came was for the King Tut Exhibit. But, news flash: He's not here. King Tut, himself, has never left Egypt. We did see lots of ancient Egyptian artifacts, though, and several pieces from his tomb. To be honest, though, the exhibit took some getting used to. 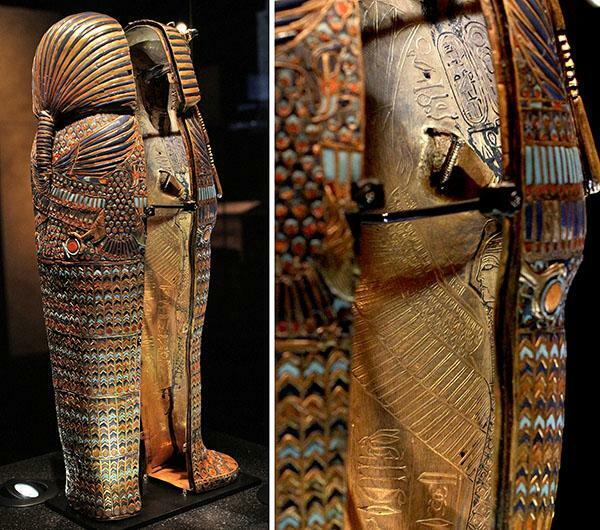 Back in 1978, the exhibit that came to Seattle included Tut's gold sarcophagus and a funeral mask. Though there were some beautiful pieces, this wasn't nearly as breath-taking as I had expected. And it was dark. Literally. What museums call "strategic lighting" should be read as "seriously under-lit". Really? Are a few incandescent light bulbs going to cause the abrupt deterioration of stone statues that have lasted 3000 years or more? On the good side, no crowds. I'd heard about people standing in line for hours to see the 1978 exhibit, but not so this time. PSCI sold timed tickets. Kerry bought ours for 4pm, hoping all the school groups on field trips would have cleared out (yes! Why does their IQ and behavior drop so drastically when they're in herds?) and we were able to enjoy wandering through the exhibit at our leisure. 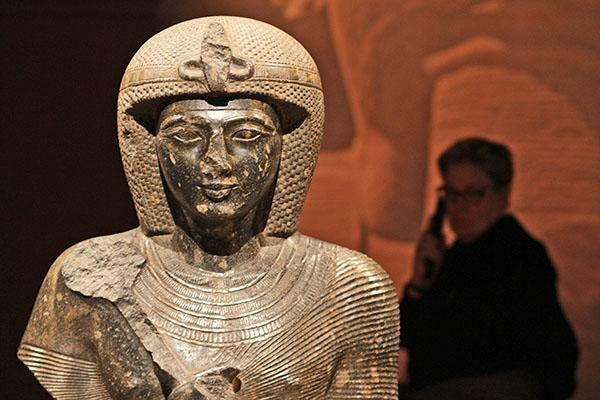 This statue depicts Rameses II, known as the Pharaoh of the Exodus. 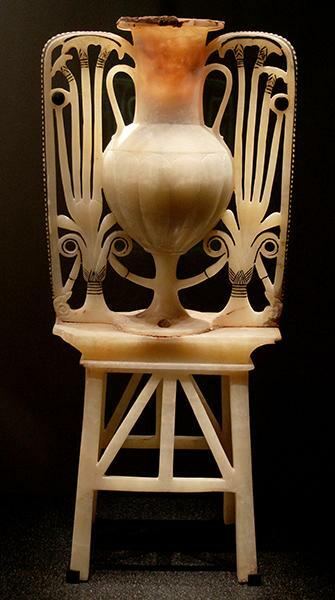 Several of the pieces were carved from calcite, which is translucent when it's thin enough, as you can see with this unguent vessel. 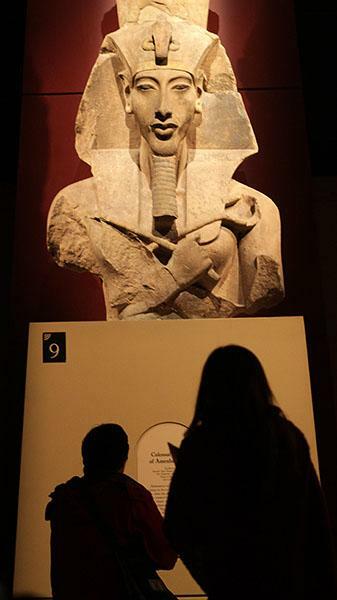 Amenhotep took the name Akhenaten when he tried to change Egypt from polytheism to monotheism. The statues show his face and body being very elongated, and some people believe he had Marfan's Syndrome. It's beautiful. It's gold. But it's not Tut. 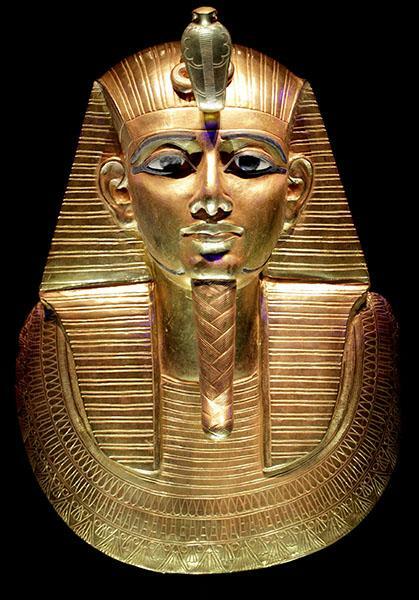 That is the golden mask of Psusennes I. 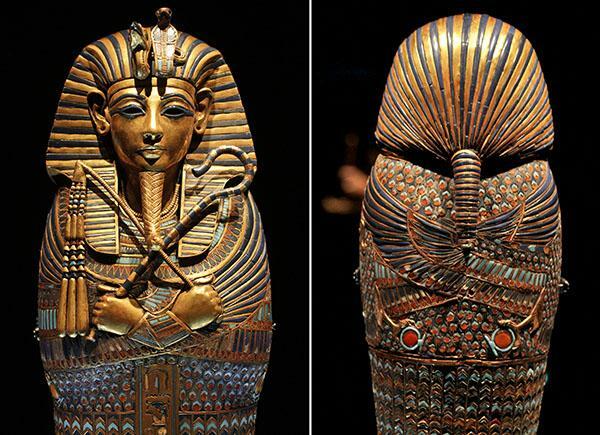 Actually, it's called a canopic jar, and there were four of them holding various internal organs. Except the heart, which they believed held the person's essence. And the brain, which they believed to be worthless and threw away, if I remember right. Even the inside was detailed with an image of a goddess and a spell from the Book of the Dead. Besides these things pictured, we saw the gold finger and toe protectors that were found on King Tut himself, a lot of amazingly beautiful and detailed jewelry (with amazingly expensive replicas for sale in the gift shop), and a small coffin in which a royal cat was buried. Just outside the exhibit we got pictures of this exact replica of King Tut's mummy, made after a detailed CT scan. Very cool, in a gory sort of way. A few years ago we had a China exhibition at a museum near here and there were some really beautiful artefacts sent from China, but we had the same issue with the lighting... it was quite frustrating. Seattle has a monorail? Cool! We are huge fans of science museums. We have a little one in Rochester, and the kids love all the hands-on exhibits. I wonder what they made the replica King Tut mummy out of? Plastic? Yeesh. Your pictures and commentary make me smile! It was totally underwhelming and dark. I agree. Your space needle picture rocks! Do you think they dim the lights so that people who try to cheat and take pictures can't get their photos to turn out right? Looks like you guys had a blast!